Best deal tours! Lower price. Highly recommended Services! Good equipment, Knowledgeable, hardworking, honest and friendly Staff. High quality Services ! . We offer many options of holiday plans leading you to discover the special peruvian beauty and the inca empire civilization. On this tour you will have the opportunity to explore, take beautiful pictures and walk along the Machu Picchu paths with calm. It is a great adventure because you will have the opportunity to explore the mandor waterfalls. 13:45 Hrs. Aprox. We will visit the Cusco city, visiting the Main Square, the Cathedral and the tempo of the Sun or Koricancha. We will drive out of the city to visit the Inca sites of Qenko, Puca Pucara, Tambomachay and impressive archaeological complex of Sacsayhuaman strategically built on a hill overlooking Cusco, famous for its enormous carved stones joined with astounding precision to form the outer walls, some of them standing over 9 feet tall and weigh over 350 tons. 18:30 Hrs. return to the city of Cusco. Overnight: Hotel*** in Cusco city. Pisaq, typical Andean village, traditional and archaeological where there were the famous fairs, visiting fairs, typical markets and archaeological remains. Ollantaytambo Archaeological Group, agricultural complex administrative, social, religious and military time Tahuantinsuyo, comprising temples, platforms and connected by a complete system of irrigation canals. 5:00 AM aprox. : Hotel pick up and transfer to the Ollantaytambo train station. Then, you will take the train to get Machu picchu town (the train lasts about 2 hours). Then, we will pick you up from the Machupicchu train station and transfer to the hotel. In the afternoon, we will start a nice walk to Mandor Pampa. Mandor pampa is a beautiful area that exhibits a wide variety of local flora and fauna, such as orchids and bromelia. The hike follows the railway tracks for 4 km, parallel to the course of the rushing river Vilcanota. The trail then passes through an old coffee plantation before entering the cloud forest, following the river for about thirty minutes before arriving at the falls. Along the route we will pass through plantations of coffee, bananas, avocado and medicinal plants, until the surroundings become wilder and we are able to observe many species of butterflies. The waterfall itself is about 12 metres high; the water arrives here from the sacred peak of Yanantin. Further along the trail, deep in the forest, it is possible to spot spectacled bears, coatis, and river otters, as well as hundreds of bird species. Early wake Up (by 05: 30 a.m.), Breakfast. We will take the early Tourist bus Up to Machu Picchu Sanctuary. 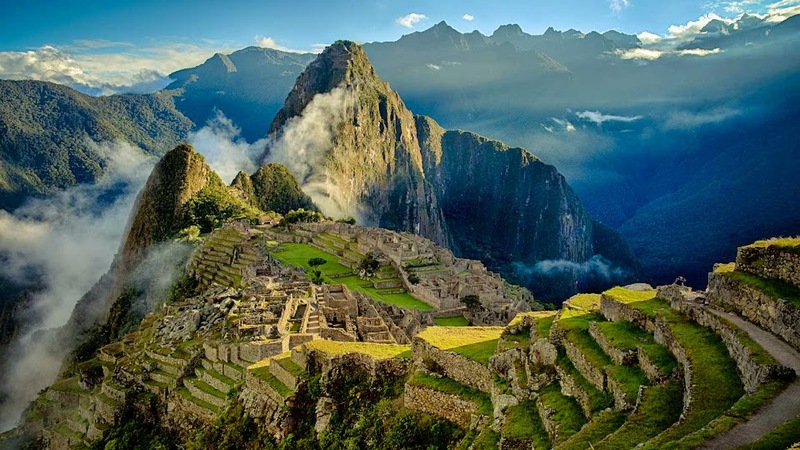 The exciting exploration begins with a visit to the world famous Machupicchu Sacred Temples (Sun Temple, Condor Temple) agricultural terraces, sacred rocks, water fountains, the famous Intihuatana and other important Inca buildings. During the tour, our guide will explain the meanings , importance and story of Machupicchu while we walk around the Machu picchu city for around 2 hours. After your tour you'll have free time to explore the site by yourself. Later in the afternoon you will take the bus back down to Aguas Calientes where you will take the train back to Ollantaytambo and then carry on by car to Cusco, where we will arrive late at night. All departure and arrival times are approximate. Entrance fees to tourist sites. A local experienced English - Spanish tour guide. Round trip Train ticket (Ollantaytambo - Aguas Calientes - Ollantaytambo). Round trip Bus ticket (Aguas Calientes - Machu Picchu Sanctuary - Aguas Calientes). Two hours Machu Picchu guided tour. Entrance ticket to Mandor pampa. Prices in U.S. dollars are based on per person, departures are guaranteed. This tour includes the Expedition Service. The Expedition train has fully covered wagons with panoramic windows to allow travelers to immerse in the beauty of the natural landscape, and make your experience at Machu Picchu begins on the train. All hotels included in our programs are three stars (Tourist class). Rooms are equipped with cable TV, hote water 24 hours, and bathrooms with free toiletries. Free wifi. Some rooms have air conditioning. Featuring a restaurant and a coffee shop. Machu Picchu Children, $ 20.00 per person (Passengers under 18 years old receive the same discount as a student. If you are claiming a child discount you must send us a scanned copy of your child's passport by email). Machu Picchu Andean Community: Peru, Colombia, Bolivia and Ecuador : $ 20.00 per person. NOTE: INCA PLANET TRAVEL GUIDE reserves the right to make the final decision regarding amount of discount. Also we offer special discounts for groups. Hat or cap to protect from the sun. Sun cream (factor 35 recommended), lip salve, sun glasses. Camera + Batteries (Batteries can easily be bought in Peru and is of excellent quality). Swimsuit (if you plan on visiting the hot springs.